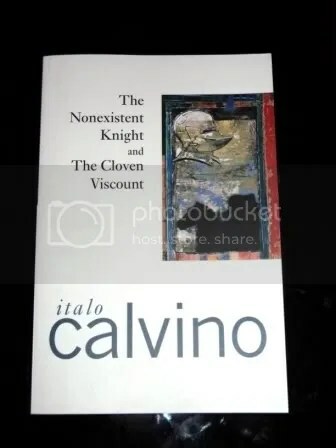 The Cloven Viscount is a novella by the famed Italian writer Italo Calvino. Together with The Baron in the Trees, and the Nonexistent Knight, it forms Calvino’s popular Our Ancestors Trilogy. The Cloven Viscount is a fantastic novella about a Viscount who is exactly as the name implies – cloven. At the start of the novel, an unfortunate accident befalls Viscount Medardo on the battlefield in a war between Christians and Turks. Miserable upon finding himself split in half, Medardo travels back home to claim his birthright as Viscount of Terralba. Shortly after his arrival, it becomes evident to all who live in the village that the half of Medardo which has returned to the village is his evil half. Evil Medardo does not waste any time, and busies himself with coming up with ingenious ways of committing malicious acts toward the townspeople. Medardo’s evil half tortures small animals, destroys everything around him, and doesn’t give a second thought to killing or injuring both guilty and innocent people alike. Like his bad half, Medardo’s good half decided one day, to come back to his hometown. The villagers, who at first could not tell the difference between the two halves, were confused at the Viscount’s sudden change of demeanor and random acts of kindness. They soon realize, to their amazement, that it is Viscount Medardo’s other half – his good half, which was responsible for all the good deeds in the village. Naturally, his good half is the exact opposite of his evil half. Good Medardo devotes his life to performing selfless acts for the betterment of the community, or so he thinks. He tends to the poor, the weak, and the lame, he counsels and preaches against immoral and impious acts. As much as the villagers hated living with the evil Medardo in their midst, they also hated having the good Medardo around. Good Medardo’s acts of kindess, to them, was just as bad as evil Medardo’s acts of maliciousness and evil. Through Medardo’s opposite halves, Italo Calvino illustrates two opposite sides of a person that must co-exist in order for him to be complete. A completely evil person, set on destroying everything around him, will eventually destroy himself, just as a selfless person, who dedicates himself to the woes of other people, with no regard for his own well-being, will eventually hurt himself. A person who is completely good and pious, or is completely evil, cannot and does not exist. However, in his idea that man has two opposing sides inside him, I feel that Calvino is saying that just as every good person has a cruel, unjust side, a person generally classified as evil must have a good, compassionate side. In this way, I feel that Calvino sees humanity in an optimistic light. The villagers hatred for evil Medardo, and later, for good Medardo illustrates that an excess of kidness and morality is just as bad as an excess of cruelty. Random acts of kindness, though well meant can lead to harmful conclusions, just as a seemingly cruel act, can sometimes produce good results. Another aspect of the story, I feel, is the concept of incompleteness brought about by youth and inexperience. In the beginning, it is the Viscount’s youth and inexperience that lead him to the battlefield to his unfortunate accident. This aspect can also be seen in Medardo’s young nephew, who is also the narrator the story. The young boy fills his days wandering the village and forest, looking for adventures and interesting activities. He is equally fascinated and repelled by both halves of his uncle, and by the other people in the village. The young narrator admits to youth being a form on incompleteness. He daydreams all day about fantastic stories, and yearns for adventure. In the end, both he and Viscount Medardo are wiser than they were at the beginning of the novel. Unfortunately, unlike his uncle, who is older, and is therefore, more complete, he is disappointed with the eventual onset of adulthood – of having responsibilities and forever chasing after things that can not be attained or understood. These books are so good! Thank you for reminding me of them. I especially liked The Barron in the Trees, but they’re all such great reads. I really need to read more by Calvino.